Lord Alfred Tennyson, the great poet laureate of England, never visited America, but his writing was known throughout the land, even in the arid region of Pecos, Texas in 1893 a year after the author died. Only a few decades or so before, Apache and Comanche tribes roamed the area and only a few intrepid pioneers had attempted settlement in that remote part of the state. Thanks to railroad expansion in the 1880s, a bit of civilization came west to Pecos, including Mr. Tennyson, all dressed up in Morocco. I'm not sure what Pecos Bill would have thought about that. 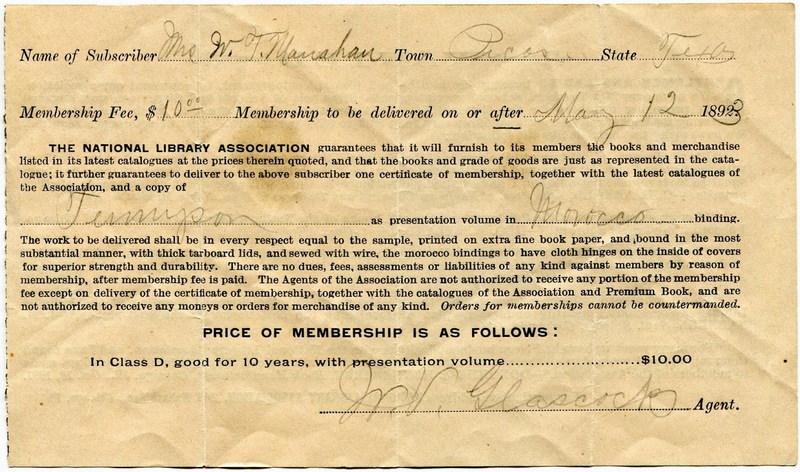 Above is the receipt for a $10 Class D membership, whatever that is, good for 10 years in the National Library Association. W.V. Glascock is listed as the agent who sold the membership. Mrs W.T. Monahan is the new member and probably anxious for some fine books to provide a little culture in her home in a desolate region of the West. In addition to her membership, Mrs. Monahan would also receive a presentation volume of something written by Lord Alfred Tennyson. The receipt just indicates Tennyson, no title to go with that. But it was a nice copy bound in Morocco. Perhaps Mrs. Monahan had a choice of books from which to select her first book. The Chicago Public Library has in its Trade Catalog Collection an 1891 catalog from the National Library Association at the address indicated on this receipt. That helps confirm the company was in business for at least a few years. 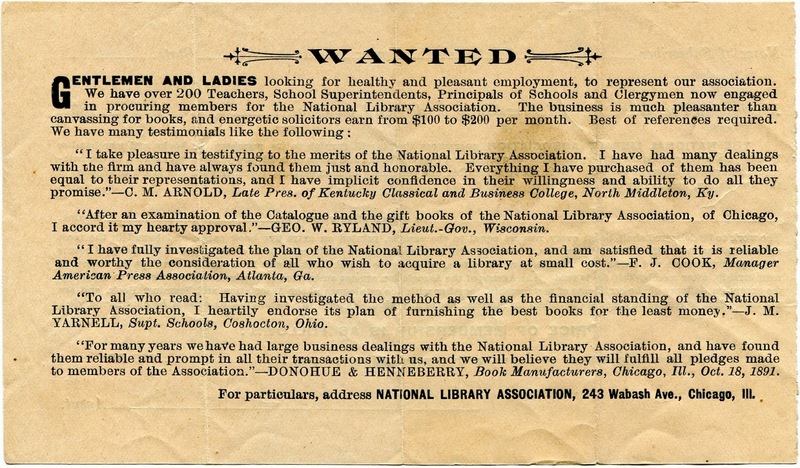 The reverse side of the receipt advertises for agents to sell memberships and offers testimonials, including one from Donohue & Henneberry, a reputable book manufacturing concern in Chicago that claimed a good business relationship with the National Library Association for more than just a few years. An endorsement from them was pretty solid. 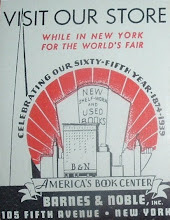 Quite possibly, they were supplying the books to the National Library Association. 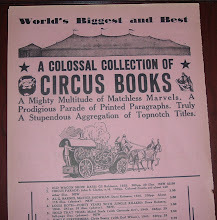 In 1890, as the link above indicates, they began publishing a series of inexpensive editions of popular novels. So the timing is consistent with the date on this receipt and three years later one of those editions may have landed in Pecos, Texas. Gentlemen and Ladies looking for healthy and pleasant employment, to represent our association. We have over 200 Teachers, School Superintendents, Principals of Schools, and Clergymen now engaged in procuring members for the National Library Association. 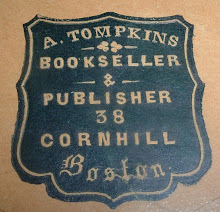 The business is much pleasanter than canvassing for books, and energetic solicitors earn from $100 to $200 per month. It goes on to offer testimonials from the kinds of individuals that are in their apparent target population for prospective employees. W.V. Glasscock fit the profile. He was a teacher, or at least earned a certificate from one of the state's normal schools in 1889. An article in the Austin Weekly Statesman, from August 29, 1889, states the the Education Department in Texas granted certificates to... a list of qualified students follows, in which Glasscock, of Ellis County, Texas, was named a recipient. In a 1902 obituary for Glasscock's brother (Ellis County Archives), W.V. is listed as a survivor and said to be a rising businessman in the county. 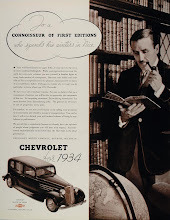 Could selling books as a young teacher a decade earlier have been a part of that?